Princess cut rings feature some of the most stylish gemstone cuts with sharp edged corners and nearly unrivaled brilliance. This square shaped diamond is matched in brilliance only by the 'round brilliant' cut. Developed in 1980 specifically for brilliance, the princess cut engagement ring is a rapidly rising star in the world of diamonds and represents a modern alternative to round cut engagement rings. A informational video about the princess cut. One of the most significant advantages of the cut is economy. A princess cut diamond retains between 60 and 80% of the rough diamond. By contrast, the round brilliant keeps only around half (50%) of the rough gem. This means for the same carat weight and quality diamond, princess diamond engagement rings will be considerably cheaper than their round brilliant cousins. Another way of putting it is, for the same budget, one can get a considerably heavier princess cut diamond than a round brilliant. Although they were considered avant garde in the 1980s and 90s, no one is surprised that princess cut engagement rings have lately become one of the most highly demanded engagement ring choices, and still rapidly rising in popularity. 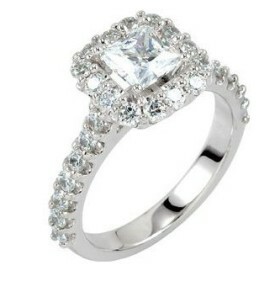 James Allen is the most reputable and affordable online source of princess cut engagement rings. 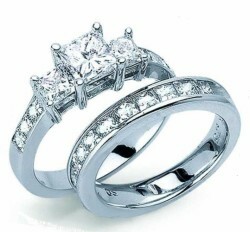 – Wide selection of princess cut engagement rings and loose diamonds. – 3 Dimensional images of every loose diamond and engagement ring. – Integrated free system to Build-Your-Own-Engagement-Ring. 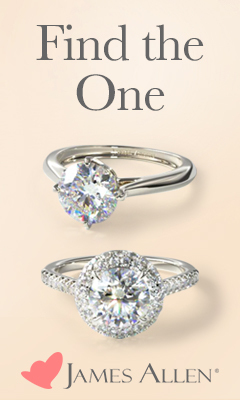 Design the ring of your dreams that is 100% unique to you. – 60-day 100% unconditional free return policy guarantees satisfaction. The princess cut is a generous and dynamic cut that remains just as brilliant within a wide range of dimensions. Within the industry, there are no universal standards or consensus on an 'ideal' princess cut diamond. As a result, many reputable gemological laboratories in the United States and Europe such as GIA do not even offer a grading scale for this cut. For anyone considering this stone, if the cut is even graded, it should be among your lowest priorities. Viewed from the top, the upward facing side (crown) of a princess cut diamond is typically square shaped and consists of 21 facets. The girdle will always be cut with 4 facets resulting in the signature square or rectangular shape. Length to width ratios of 1.05 or less will result in a square while above this will be more rectangular. Although square is more common, a wider rectangular cut can result in a larger stone that will look spectacular as the center stone in a three stone ring, for example. Viewed horizontally, the downward facing or bottom side of the gem (pavilion) consists of four beveled edges ending in a point to resemble an inverted pyramid consisting of either 25 or 33 facets (two variations). The two variations of diamonds for princess cut engagement rings are 50 and 58 facets but because they have no difference on the stone's brilliance, have little or no impact on its value. Due to the generous optical nature of this cut, the exact dimensions of the stone will have little or no impact and Princess cut engagement rings are guaranteed to be incredibly brilliant. Princess cut rings work well in a number of settings. Every good setting for a princess cut diamond must be able to protect the four sharp edges. Even so, there are a wide range of settings that are ideal for princess cut diamond rings. 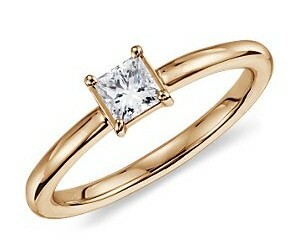 A solitaire princess cut diamond should always have a four pronged setting with a prong over each corner of the stone. Princess cut diamonds also work well as accent stones to complement a different center stone. For this role a pave setting is popular where small princess cut diamonds individually 'paved' around a portion or the entire length of the ring, starting at the main solitaire stone or three stone ring. 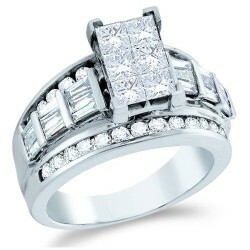 Princess cut engagement rings in channel settings are also quite popular. The channel setting is very similar to the pave setting except that in the channel, each stone is set entirely within the structure of the ring (in the channel). The incredible new and unique setting called the invisible setting exclusively uses slightly modified princess cut diamonds. The invisible setting features row after row of princess cut stones with no metal or structure in between. Because they are set as a “solid wall of diamond”, the invisible set requires unique grooves cut into the pavilion (base) of the diamond that will snap into place on the metal frame underneath. Therefore, the invisible setting requires diamonds specifically cut for this set and are generally not sold as loose stones. Invisible set princess cut diamonds are also prominently featured in art deco engagement rings as well as fancy mens diamond rings and mens engagement rings. Whether you are looking for princess cut engagement rings or diamonds for another occasion, rest assured that princess cut diamond rings are the most brilliant jewelry pieces on the market.